I feel like I might be the only one still in school. That can't be true since I know that Holly (from Crisscross Applesauce in First Grade) and all the other Michiganders are trudging through the last couple weeks with me. My post is going to have to be short today (busy day). Church (check). Sunday school (check). Groceries (check). Laundry (in progress). Graduation party (later this afternoon). Snuggling with my kids (top priority). 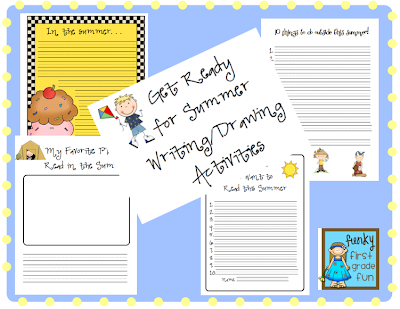 If you're still in school and you need some fun things to do to keep your kids busy during the last few days, check out my Get Ready for Summer Writing and Drawing Activities. My students did a few of these activities last week and will do the rest in the next two weeks (in between Windexing everything and spreading shaving cream on the tables/supply bins). 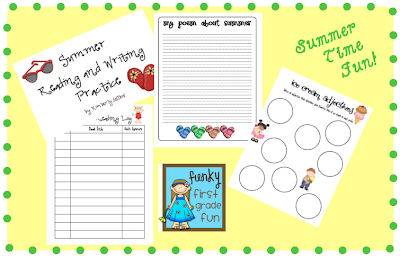 I also have a Summer Reading and Writing for Home pack that I send home with students to help them maintain their current reading/writing levels over the summer. I tell my students that if they return the packet to me during the first week of school in September, I'll give them a little prize (which is usually a bookmark, a pencil or eraser). Last year, about 1/2 my students returned it (which I was happy with). We still have 8 more days! Have a great end of the year! 8 days left for us too! As a teacher in West Michigan, I am just thankful that we didn't end up having to add time due to snow days! Enjoy your last few days! !